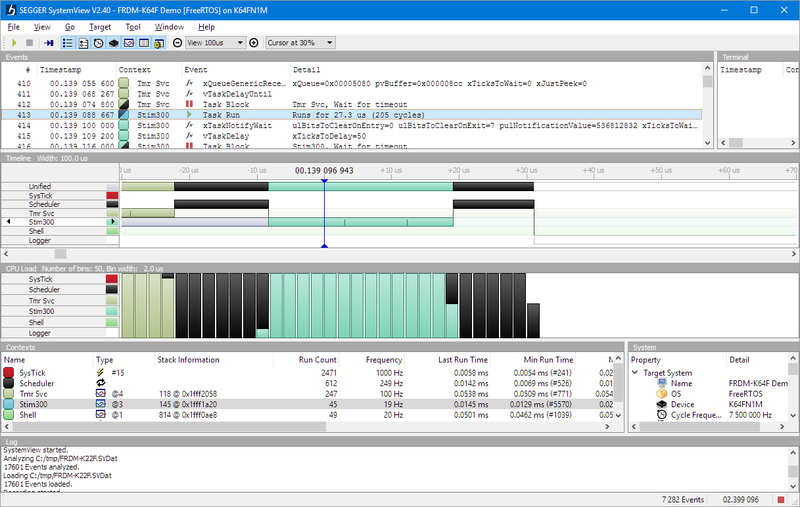 With debugging FreeRTOS applications in Eclipse, it is a big to have views available showing all the threads, queues, timers and heap memory allocation. One of the best Eclipse plugins are the one NXP provides for FreeRTOS: they are free of charge and give me pretty much everything I need. However, if you are not that familiar with FreeRTOS itself, here are a few tips to get more out of the plugins. 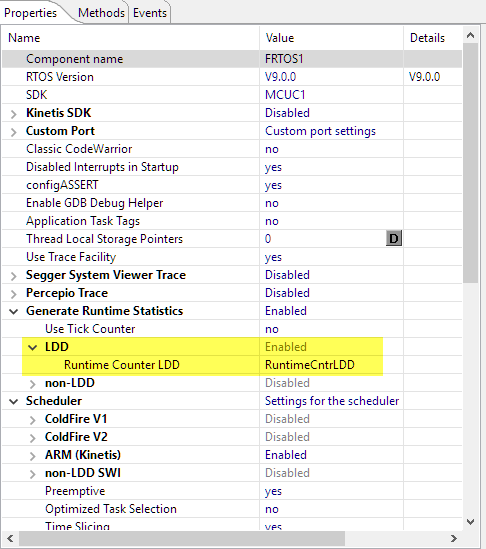 In this article, I show several tips and FreeRTOS configuration settings, how to make debugging FreeRTOS in Eclipse easier. 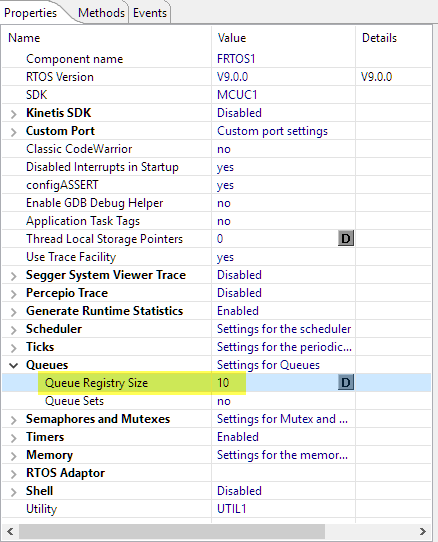 There are several settings in FreeRTOS which stores more information in the kernel: while this usually has a small price (RAM, ROM, execution time), it greatly simplifies debugging FreeRTOS applications. And if you are concerned about the overhead, you can turn it off after debugging. 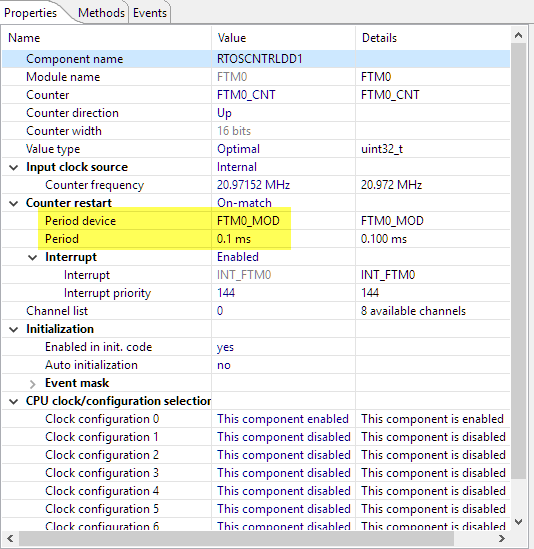 For installation, see FreeRTOS Kernel Awareness for Eclipse from NXP. For FreeRTOS, I’m using the latest FreeRTOS V9.0.0 with some V9.01 extensions (see “McuOnEclipse Components: 12-Mar-2017 Release“). If you want to have the source code, it is available for example on GitHub (https://github.com/ErichStyger/McuOnEclipseLibrary/tree/master/lib/FreeRTOS/Source). 💡 Be aware that this setting not only adds the TCB number, but turns on other debugging features: it will increase the RAM and ROM footprint for your application. The TCB numbers itself do not offer big value, but I can see in which order the tasks have been created, if I’m interested in that information. 💡 Don’t use a task name too long, as it consumes more RAM. A number of about 10-15 bytes should be enough. 💡 Using runtime statistics increases the RAM and ROM footprint of your application too. 💡 Keep in mind that the extra timer is affecting the overall system load. 💡 The stack size (392 bytes) is almost correct (should be 400 bytes), probably because the first and last entry is not counted. 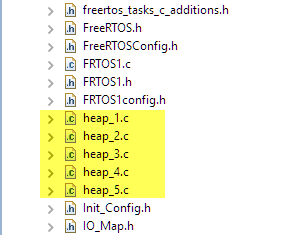 FreeRTOS supports by default up to 5 different heap allocation methods (schemes). The normal way is just to have one of them in the build, and the others deleted/removed from the project. 💡 There is a bug in the version 1.0.1 of the NXP Kernel Awareness Plugin: if the variable freeRTOSMemoryScheme is present, it is always read with a value of 5 which is wrong. That bug has been reported and should be fixed in the next version. Until then, best if freeRTOSMemoryScheme is not used. I hope this article helps you to debug FreeRTOS application. There are several settings shown above which really makes life easier. 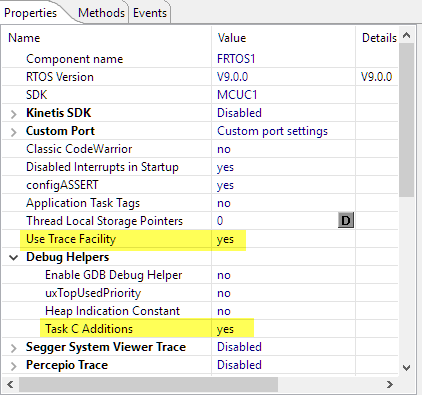 On top of that, there are tracing solutions with FreeRTOS which help beyond ‘stop-mode’ debugging. This entry was posted in ARM, CPU's, Debugging, Eclipse, Embedded, FreeRTOS, Freescale, KDS, Kinetis, LPC, LPC, NXP, Processor Expert, Tips & Tricks and tagged Debugging, Eclipse, Embedded Component, FreeRTOS, Freescale, open source projects, P&E, Percepio, Processor Expert, Segger, software, software project, technology, Tips&Tricks, Tracealyzer by Erich Styger. Bookmark the permalink. I just have a couple of questions, though. 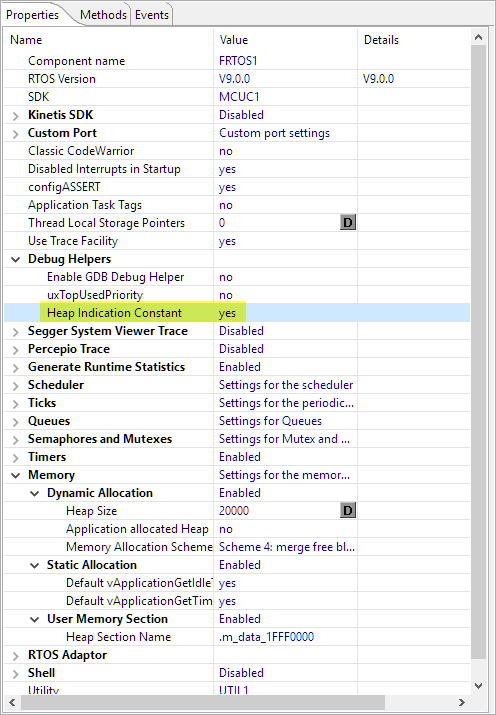 I’m not using the MCU on Eclipse components, so I don’t have a way of configuring all this exactly as you mentioned in the article, nevertheless, I’m trying to add all these configurations by hand and I’m experiencing a couple of issues. The first one is regarding the “configRECORD_STACK_HIGH_ADDRESS” addition. I have added it to my config file but nothing happens. Is there anything else to be done besides adding this #define? But, the warning icons are still there, nothing changes. Could you help me with this issues, please!! The McuOnEclipse FreeRTOS is bleeding edge, so the configRECORD_STACK_HIGH_ADDRESS is not part of v9.0.0, but in the upcoming v9.0.1. You find the latest version on GitHub: https://github.com/ErichStyger/McuOnEclipseLibrary/tree/master/lib/FreeRTOS/Source. 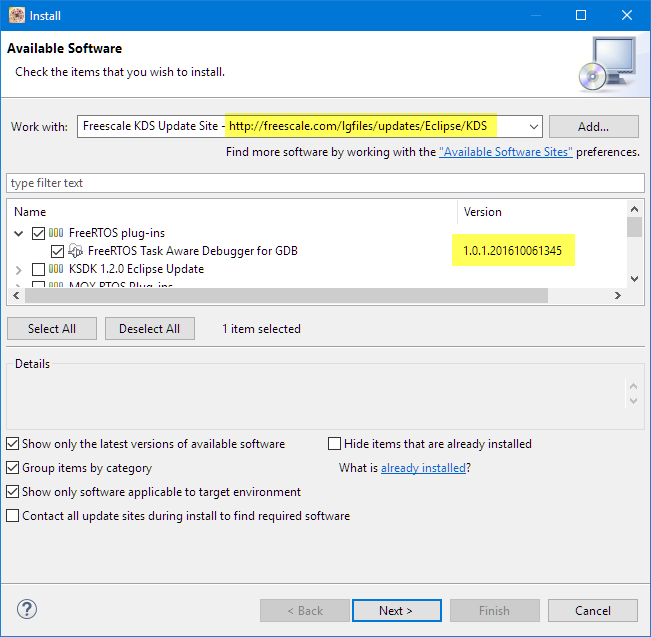 If you insist using your version of FreeRTOS (v9.0.0 I asssume? ), then you have patch your version with the changes. Best if you get the version from that GitHub repo and search for configRECORD_STACK_HIGH_ADDRESS. It is used in FreeRTOS.h (3 times), FreeRTOSConfig.h (1 time) and task.c (4 times). 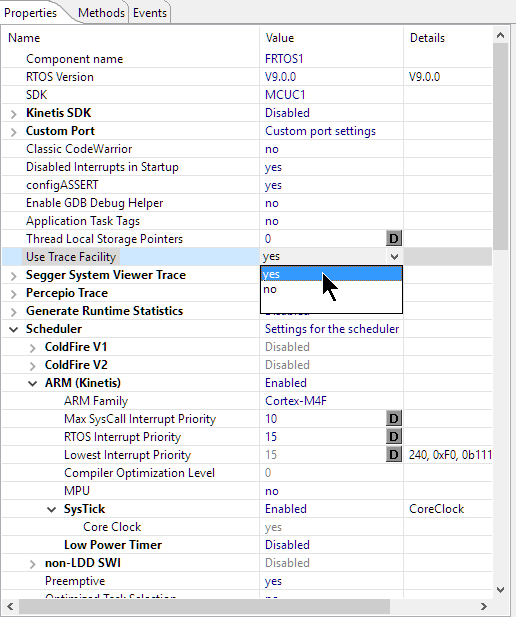 You can use that version of FreeRTOS directly, as it does not need Processor Expert, and works nicely with the NXP SDK (I have an example project here: https://github.com/ErichStyger/mcuoneclipse/tree/master/Examples/KDS/FRDM-K64F120M/FRDM-K64F_McuLib_MCUXpressoSDK). 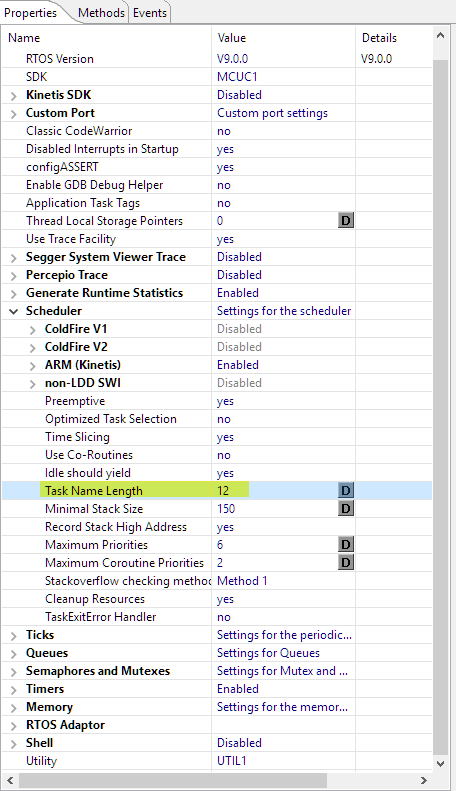 congratulations on such a detailed post with a very handful tool for FreeRTOS. I am trying to use it with MKL26Z128VLH4 in my custom board, but I am facing a problem to debug it. I designed it following the same basic circuit of FRDM-KL26Z with a 10-pin SWD connector. However, when I try to flash or debug it, I see the message: “Device is secured. Erase to unsecure?” and it never succeeds. If I populate this same board with a MKL25Z128VLH4, it works flawlessly. I compared MKL25 and MKL26, but I can’t find any hardware difference related to the vital signals. Have you ever had such a problem? I’m a huge fan of your blog. MCoE has been so helpful for me, and all the other kinetis embedded developers I know. I have been trying to develop a project for the MKL26Z (currently just with the FRDM board) that merges together my application code, FreeRTOS, and the Freescale/NXP USB stack. (CDC app) The specifics of my application (and other issues) have led me to avoid Processor Expert for this project, so it is bare metal. I have no problems with my application and FreeRTOS, but I have been unable to get anything working when I merge in the USB stack, I get stuck in the default interrupt handler in many different ways when I call the usb init routines. I would love to look at an example project combining these three things – FreeRTOS, USB-CDC, and not processor expert. Do you know of any or where I can find one? I’m running KDS v3.2 and KSDK 1.3.0 with my project but I can install another IDE/SDK if needed. many thanks for your kind words, appreciated :-). Is there a likely cause of this error that you could suggest? I don’t remember seing that. FreeRTOS Task Aware Debugger for GDB	1.0.2.201704260904	com.nxp.freertos.gdb.tad.feature.feature.group	NXP Semiconductors, Inc.
– run control: what debug interface (P&E? Segger?) are you using? Make sure you have the latest versions installed. It could be that stepping/breakpoints are not working properly. – the FreeRTOS views many reads from the targets. Does the problem occur as well if the views are not open or behind other views? The V1.0.2 plugin has a ‘pause’ button to silence it, maybe this helps? 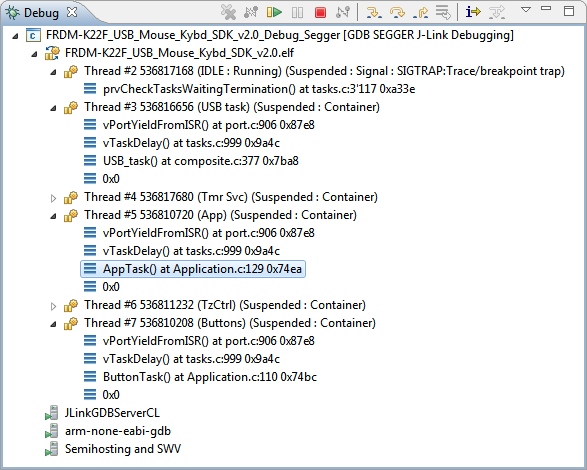 Other than that: there is a FreeRTOS_TAD_logs folder inside the workspace, maybe this gives some clues. If this does not help, maybe open up a question in the NXP forum with the log file/information. I can try to ping the contact I have for the plugin in NXP so he could have a look. I have just tested it again after removing Segger RTT from the project and it works as expected. I am using FreeRTOS 9 in stock MCUXpresso with the latest Segger software JLink_V614g with a Jlink pro. So for now I will assume it was something to do with the RTT code competing with the segger plugin. That’s at least some good information. 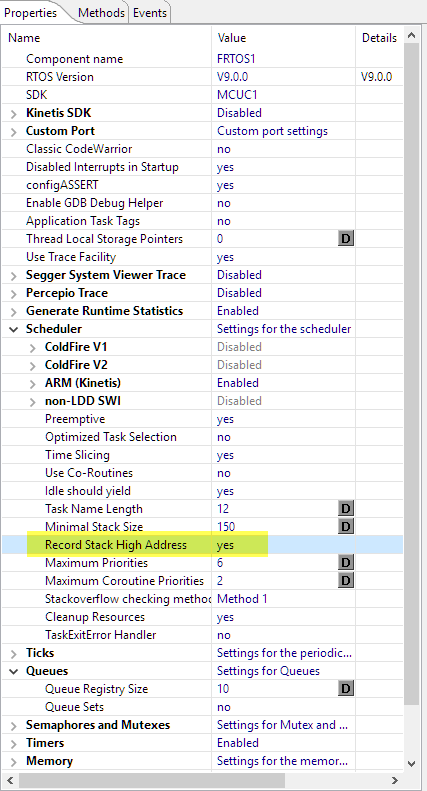 I would increase the task stack size because the Segger RTT might use some extra stack? In case others are having trouble getting the configGENERATE_RUN_TIME_STATS to work, you may have to remove the “static” keyword from ulTotalRunTime. For some reason with my near vanilla Eclipse Neon.3 CDT workspace and FreeRTOS v9.0.0, the plugin was unable to find ulTotalRunTime otherwise. thanks for sharing! Interestingly, somehow I have not seen this. How did it manifest? Did you had some messages on the Console log about this? Hi Erich, thank you so much for putting all the work into your posts. I am sure it helps lots of people. I have a question and maybe you have already thought about it. 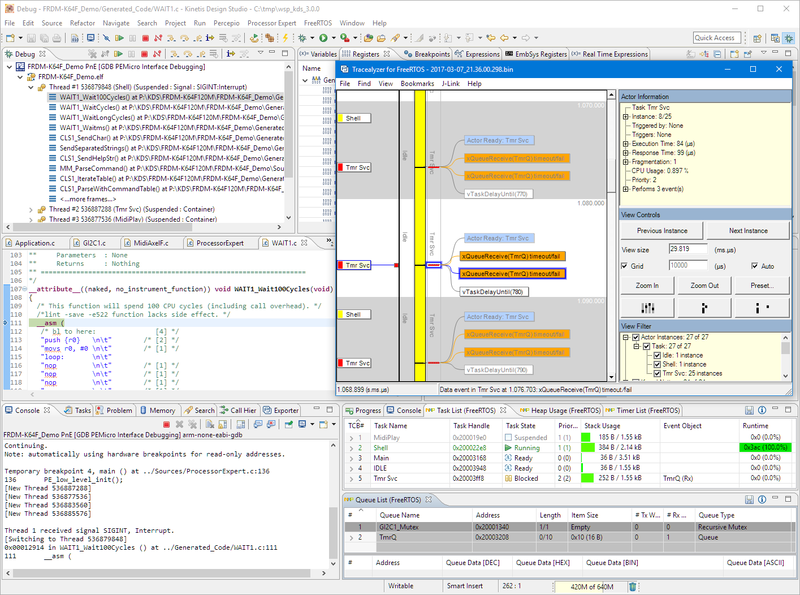 Would you be able to do a comparison between third party debuggers (JLink, P&E) and the native LPC-Link 2 CMSIS-DAP for debugging FreeRTOS? 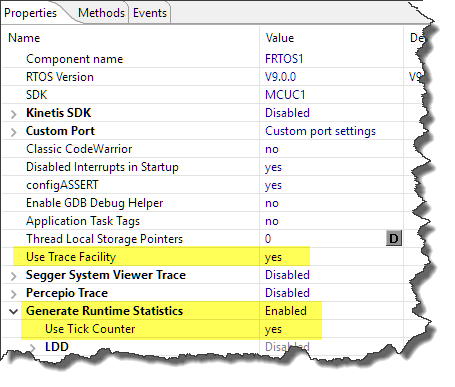 such a comparison does not really make sense for debugging FreeRTOS, as they are all providing about the same experience. The differences (at least todate) are very minimal, e.g. for P&E and Segger you can turn off the thread debug awareness. From the speed perspective they are all more or less the same. Segger has the advantage of having ‘unlimited’ flash breakpoints and other useful tools, while P&E has good options and gdb support. The LPC-Link2 has the advantage of a very low price point of about US$20. In any case, I recommend to have one probe of each: that saved my life several times in case one probe for whatever reason had a problem. I hope that helps? Seems FreeRTOS is the main stream of the SDK. I am new in the FreeRTOS. Could you advise doucments for the MCUXpresso + FreeRTOS for studying? I have found a training presentation “FTF-DES-N1956” but cannot find the hands-on project. Is that possible to share us the hands-on file?